Near The Humber Bridge. UK. 42565 Miles.And Replacement Cam ChainNo 4,Replacment clutch plates No 1,New Radiator , 2nd set of coil sticks, DNA Filter, L E D rear light upgrade, Battery No 4. from 03/06/06 to 14/04/2019. To answer your question about the wheels and what difference they have made to the bike, here's what I've found. Cornering is soooo much easier. The bike seems far more "chuckable" (if that's a word ). I've never been that confident when it comes to cranking a bike over, but with the CF rims it just seems to inspire you to go that little bit further. It seems as though you are turning on rails at times although a decent set of boots on them always helps. I have Pilot Powers 2CT on them at the moment. The front wheel just seems to plant itself on the black stuff and that's good enough for me. Acceleration would definately be up there although perhaps having gone for a larger rear spocket (1 tooth ... perhaps 2 now that I think about it ... I'll check!) when I ordered them hasn't given me a fair comparison to the OEM rims. I have noticed that sometimes under a decent amount of acceleration the front will paw at the air just enough to make you feel like you're really shifting. Something it never done before unless I was a bit clumsy with the clutch. Braking is a big plus. I was always a late braker (too late my mates would say), even in the car. It's just the way I ride I suppose. The CF rims can make me brake even later One finger on the brake lever is all you need, such is the difference. All round stability I would say has also improved but it's hard to say as I really can't remember what the bike felt like at high speeds with the original rims on. They are a bloody doddle to clean. When mine arrived, I thought I was carrying a couple of empty boxes into the house The weight difference is jaw dropping matey. Truly jaw dropping. I could hold up the front rim with my little finger easily. No joke! The rear I could hold up with my little finger also, but not for too long though. My rims came fitted with magnesium hubs and a light weight rear spocket (with a colour of my choice .... I picked gold). 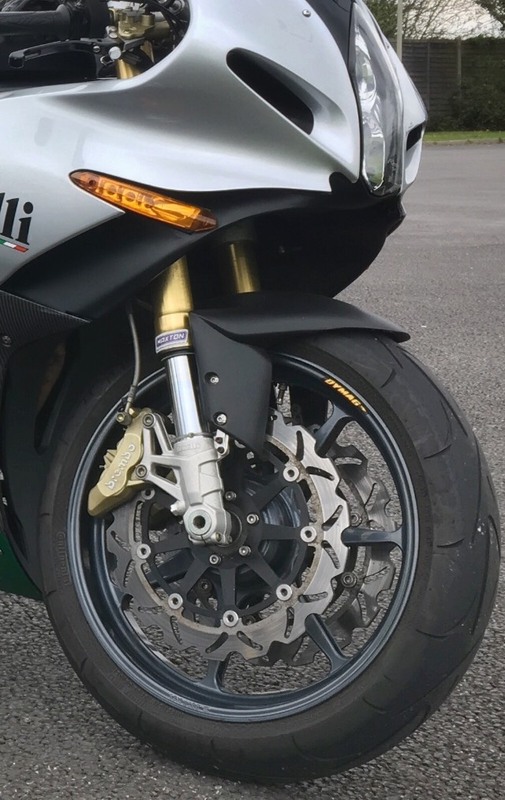 Having got the Dymags, I took them down to my local Benelli dealer (about three and a half hours away ) to have them fitted to the bike. They delivered the bike with the rims fitted and my original ones back to me a couple of days later. The bloke who was driving the van passed on a message from the mechanic who fitted them and who also took it out on a test run. He told me that I was to be very careful as the bike now seemed to have the handling characteristics of a 125! I wouldn't have gone that far but it has made a bloody tremendous difference to how the bike was before. I was so close to buying a set of BST's for mine. I have two sets of wheels though, one for touring the other with stickies fitted, and I didn't want to give up the convenience. The suspension settings are markedly different and too much of a pain to change. It's bad enough swapping pads over with the wheels, so head triumphed over heart. Engenia you are talking about different suspension settings with BST wheels. I have these wheels but havent ridden them much. What would you Think the settings should be compared to standard as a starting point? Thanks for the reply. Might have to buy a set. Cheers. I want a TreK. And a TnT. I can't remember now how the bike felt with the standard wheels but it certainly steers very sharply and precisely. The standard wheels are a work of art, but quite heavy in comparison... I notice that every time I move them around the garage! Rossi's & Hayden's New Wheels ! Scotland's new wheels - Shogun's fault!! !